North Carolina- What is DWI? Drivers operating a motorized vehicle in the state of North Carolina may be arrested for driving while intoxicated or DWI if they are operating the vehicle on a highway or street and they are either under the influence of drugs or alcohol and unable to safely operate their vehicle. Drivers can also be charged with DWI if they have a blood alcohol content level of 0.08% or higher or they have any amount of a schedule I controlled substance in their urine or blood. North Carolina drivers may have their license revoked or suspended for a variety of reasons. For instance, a license may be suspended if you are convicted of DUI in North Carolina, you have accumulated too many points against your drivers license, or you have a combination of speeding or aggressive driving violations. Revocations can also occur if you commit a felony violation with your vehicle, you are charged with manslaughter, or you flee after a car accident. Drivers who fail to make court appearances or pay their traffic fines may also have their North Carolina license revoked. It will not be possible to renew your drivers license until the license suspension period has been completed. The process to renew a license varies by state. and the suspension period will vary for drivers. For instance, some drivers who have failed a chemical test during DUI stop may have their license suspended for 60 days. Drivers who refuse to submit to a chemical test will have their license suspended for one year. These are administrative penalties enforced by the North Carolina Department of Motor Vehicles and are separate penalties from criminal charges which may be filed after a driver is convicted of DUI. Drivers convicted of a first time DUI may also have their license suspended for 60 days to one year. 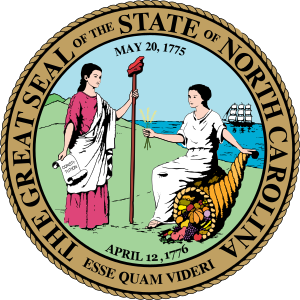 After your license suspension period has ended you must complete the requirements to have your North Carolina license reinstated. This will include a $100 reinstatement fee if your license was suspended or revoked for DUI. Unfortunately, according to the North Carolina Department of Motor Vehicles website the reinstatement for a DUI cannot be completed online so you will have to contact the DMV for all questions. They can be contacted during normal business hours (Mon-Fri, 8am-5pm) at 919.715.7000. According to N.C. Gen. Stat. 20-28., drivers who are driving on a revoked or suspended license can be charged with a Class 1 Misdemeanor charge. What does that mean? The courts will have the discretion to determine your jail sentence and fines but drivers with zero to four prior convictions may face one to 45 days in a North Carolina jail. Drivers who have five or more prior convictions face up to 120 days in jail. Drivers may also have their car impounded and have their North Carolina license revocation period extended for years. Keep in mind, if you are on probation for DWI while you are charged with driving while your license is revoked this will be considered a parole violation and you will face a probation hearing.